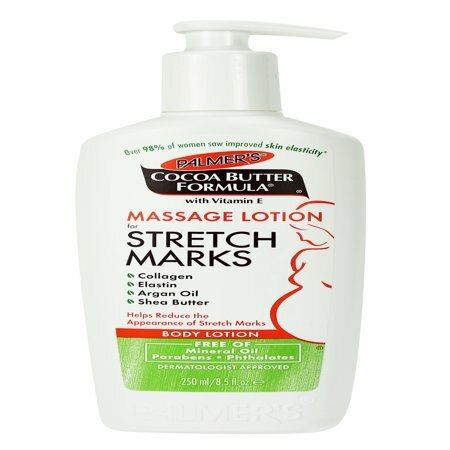 Palmer's Massage Lotion helps improve skin elasticity and reduce the appearance of stretch marks. This non-greasy lotion is ideal for all over body use, in place of your regular moisturizer. Ingredients: Water (Aqua), Theobroma Cacao (Cocoa) Extract, Glycerin, Glyceryl Stearate, Petrolatum, Propylene Glycol, Mineral Oil (Paraffinum Liquidum), Theobroma Cacao (Cocoa) Seed Butter, Cocos Nucifera (Coconut) Oil, Elaeis Guineensis (Palm) Oil, Cetyl Alcohol, Dimethicone, Butyrospermum Parkii (Shea) Butter, Prunus Amygdalus Dulcis (Sweet Almond) Oil, Tocopheryl Acetate, Centella Asiatica Extract, Hydrolyzed Collagen, Hydrolyzed Elastin, Argania Spinosa Kernel Oil, Acetylarginyltryptophyl Diphenylglycine, Hydroxyethylcellulose, PEG-8 Stearate, Phenoxyethanol, Benzoic Acid, Sorbic Acid, Behentrimonium Methosulfate, Butylene Glycol, Caramel, Fragrance (Parfum), Cellulose, Sodium Acetate, Stearyl Alcohol, Myristyl Alcohol, Benzyl Benzoate, Benzyl Salicylate, Limonene, Hexyl Cinnamal, Butylphenyl Methylpropional, Linalool. Dosage: Apply all over skin, concentrating on stretch mark prone areas such as tummy, hips, thighs and bust. Massage liberally into skin twice daily. Instructions: In place of your usual moisturizer, apply Palmer's Massage Lotion for Stretch Marks all over body 3 times per day to improve skin's elasticity and suppleness. I have used this lotion since week 13 of my pregnancy (now 36 weeks). I've also tried Burt's Bee's Mama Butter, but this is far superior to me in texture. It's very thick and creamy and rubs in nicely whereas the Burt's Bees brand is very watery and thin and never seems to rub in all the way. I know genetics plays a huge role in stretch marks, but I've been lucky and don't have a single stretch mark. I also love that I never feel itchy. Pregnant but keeping healthy skin! At first I wasn't big on the smell of this lotion. My husband says it reminds him of old chocolate. None the less, I have been using this for about 5 weeks now and I love it. I even bought the body wash.
My kid was starting to get stretch marks cause they are growing faster than normal. The marks were bright red after just a week of using this product. The mark are almost gone. so far its working well. Not a big improvement yet, but it hasn't been long enough. smells good, its smooth creamy and thick. it absorbs into the skin very fast. Don't like the new lotion. I went to buy the same lotion I'd been buying for the last 10 years. I noticed the label looked different. I assumed it would be the same, but after the first use I quickly realized it was much different. The first thing was the smell! 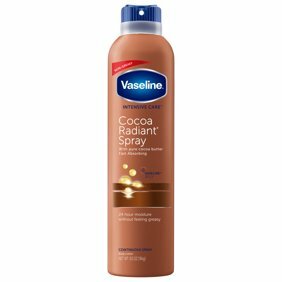 The OLD lotion was great I loved the smell, it made me want to reapply again and again. This new lotion I can't stand the smell. The second negative was when I try to rub it into my skin, it starts balling up. At first I thought my skin was peeling. I went and showered and exfoliated thinking I had a lot f dead skin on my body. But when I got out of the shower and reapplied the lotion, that's when I new it was the lotion. Now I never want to put it on, it does not rub in like the old stuff. It's just not good. I want the old stuff, can I still buy the old lotion? The new lotion with the green label across the bottom of the bottle is NO Good.